Overstory forest structure interacts with topography, trees, and shrubs. Topography and understory shrubs affect tree height and biomass, but until recently, their impacts have been relatively unknown. 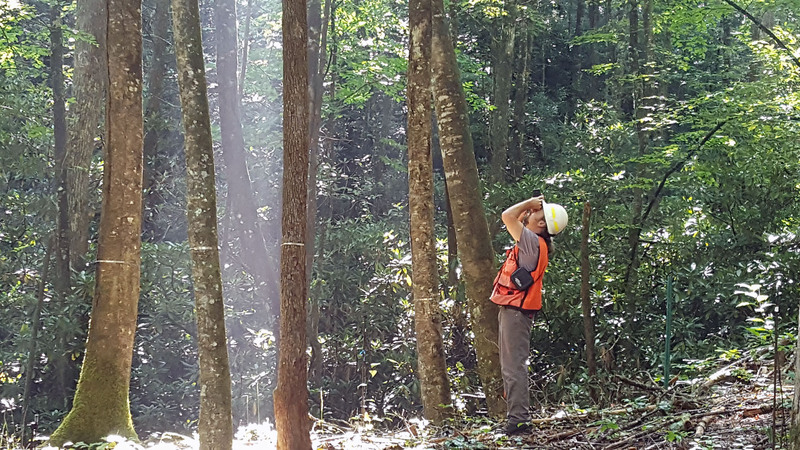 This research used Light Detection and Ranging (LiDAR), satellite imagery, and on-the-ground measurements of tree height, understory shrub biomass, and terrain in mature deciduous forests of the southern Appalachian Mountains. Our research showed that trees were much taller on north-facing slopes and cove landscape positions compared to south-facing slopes and convex landscape positions. However, after controlling for those factors, trees were systematically shorter and had less biomass when they had evergreen understory shrubs present, almost 20 feet (6 meters) shorter. Evergreen shrubs such as rhododendron and mountain laurel have become more common in the southern Appalachian Mountains. Our work suggests evergreen understory density substantially reduces tree height and biomass.